Restoration industry leader recognized by Detroit Speed and Engineering as a premier distributor! Classic Industries recently won a DSE top dealer award. 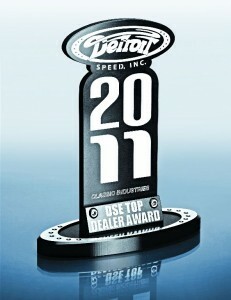 Each year, Detroit Speed and Engineering sends the award out to their top 5 dealers in appreciation for their partnership. Detroit Speed's engineers and technicians provide steering, suspension, and driveline systems that provide classic muscle cars with the performance, ride and handling expected from world-class modern vehicles. Every Detroit Speed and Engineering product goes beyond design and visual appeal with extensive engineering analysis, testing, and development to guarantee dependability and transform your project into a state-of-the-art automobile, ready for the demands of daily driving as well as track use.